Nearly 150 years later …. 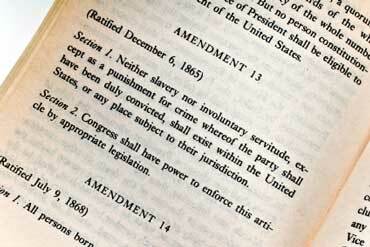 … Mississippi ratifies the 13th Amendment to the U.S. Constitution. On Dec. 6, 1864, the amendment received the two-thirds’ vote it needed when Georgia became the 27th state to ratify it. States that rejected the measure included Delaware, Kentucky, New Jersey and Mississippi. According to Wikipedia, Virginia ratified the amendment on February 9, 1865 but the ratification was done by the Unionist Restored Government of Virginia, an interesting footnote in Virginia history. One of the bills I’ve been following this session is SJ329, which commemorates the 150th anniversary of the Emancipation Proclamation. The resolution passed the House Friday, after having passed the Senate ten days earlier. I’m surprised it has taken this long to make its way through the legislature. Too bad they didn’t spell-check and fact-check SJ329. Given that Virginia’s ratification was by what many would consider Yankee collaborators, I’d suggest the Virginia General Assembly ratify the 13th itself. That would require that we get West “by fraud” Virginia back for the same reason. No, thanks. Let me get this straight — they fight a war to get us back in the Union, then put preconditions on our coming back in? Figures. The consent must come FIRST for it to be Constitutional. It’d be nice if the state capitol did not have a devotional, celebratory room of the confederacy with busts of Jefferson Davis, Alexander Stephens, and a bronze of Robert E. Lee. Or if the the sesquicentennial display on the secession crisis they have up didn’t omit the mention of slavery being at the center of it entirely. Maybe even put that ginormous painting of Harry F. Byrd in the basement. But you know, baby steps. Would we pass the 13th amendment on Lee-Jackson Day? The irony would be precious. This joint resolution should be posted in the old house chamber to share the stage with Lee, Stephens and Davis. You can’t run from history. Richmond was the capital of the Confederacy, and the Confederate Congress met in our state capital building. Therefore, I have no problem with Davis, Stephens, and Lee. The attempts to erase Confederate history remind me of communist rewrites. BTW I wouldn’t even give Harry Byrd the basement. I liked his brother Richard much better! What is done in the state Capitol is idolatry. Removing that does not run from history. They should not be given the same treatment that we give to our heroes or our paragons. There is no balance to it. It just stands now as a celebration to the defense of slavery. I absolutely think that history should be discussed, but not in the absence of what it was about. The confederacy and the institution of slavery that the confederacy was formed to defend are dark moments in Virginia’s history. Romanticizing this does the citizens of the state a great disservice. Are you suggesting that providing context and not treating these individuals as paragons afforded marble busts and bronze statues is the same thing as a communist purge?